It is early morning post Diwali. Cacophony of birds in the mango tree catch our attention. Magpie Robin, Sunbirds, a group of Oriental white eye and a tree pie are all letting out shrill calls. There must be a snake or a cat or a mongoose we presume. The alarm calls reach a pinnacle and we are forced to go out and check. Our eyes scan the area but we see no snake, no cat or mongoose. Birds keep hopping from branch to branch and are joined by some more. 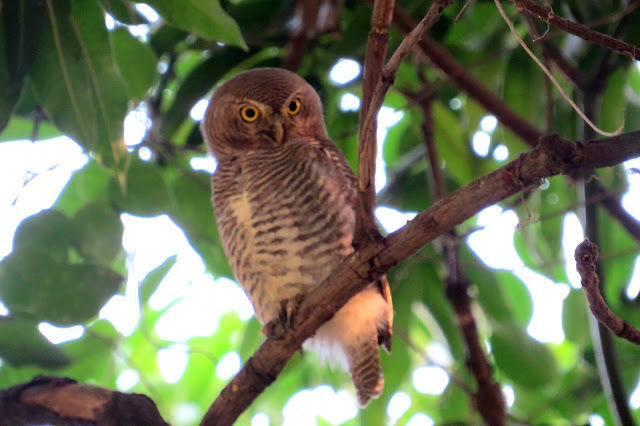 As we look up, we spot a Jungle Owlet staring at us. 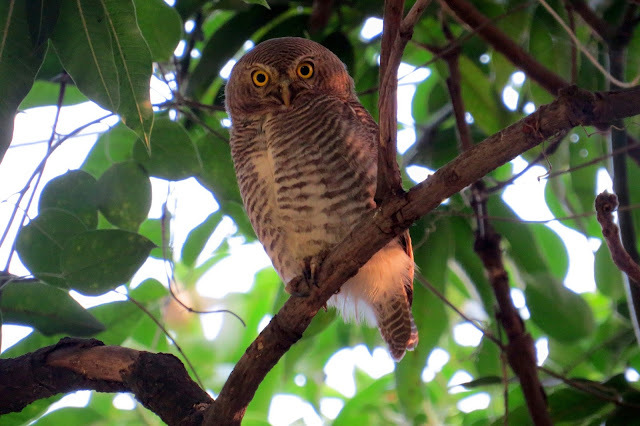 It rotated its head, looked around and again fixed its gaze on us. It remained there for twenty minutes till birds made it difficult for it to stay perched. Soon it flew away with all the birds chasing it. It is post festival time and we might have some guests over. 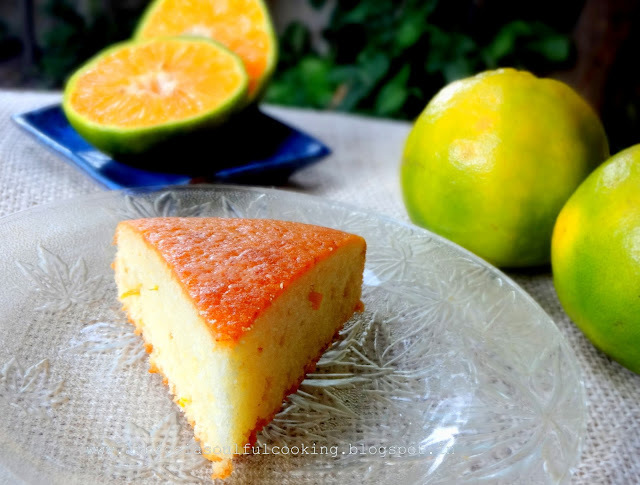 Since everyone is satiated with sweets, we decide to bake a very simple low fat orange cake that would be just ideal with a steaming cup of masala tea. It is a simple recipe and comes together in no time. Soon the wonderful aroma of cake wafts through, announcing that it is done. 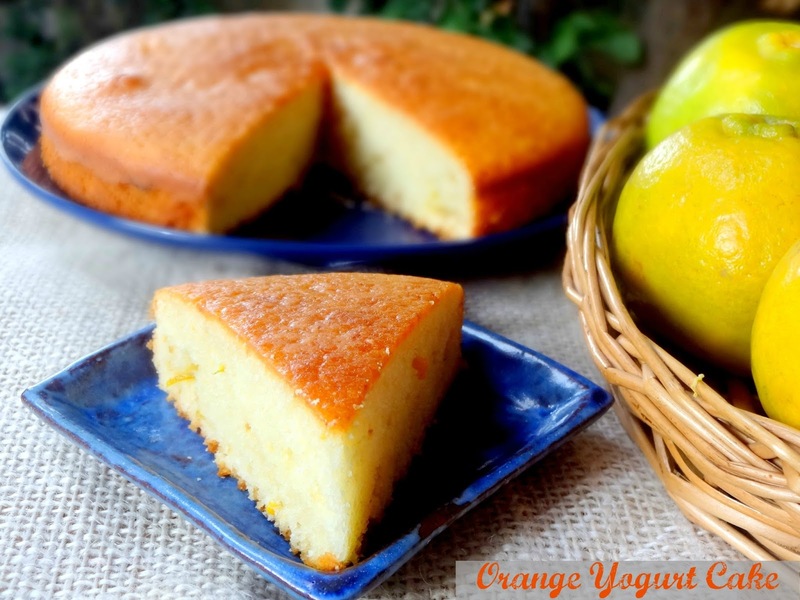 A delicious orangey moist, butter free cake is sliced and enjoyed by all. Whisk together first 4 ingredients in a large bowl. Keep aside. In another large bowl, take next five ingredients and beat well till you get a uniform mixture. You may use a hand blender for mixing. Add dry ingredients to wet ingredients and mix till you get a lump free smooth batter. Do not over mix. Stir in candied peels or zest. Pour batter into the prepared pan and bake for 25 -30 minutes or till a toothpick inserted into the center comes out clean. Cool in the rack. Anyway I could make this cake eggless? What can I replace the egg with? Hello Priya, You may add another 1/4 cup yogurt in place of egg. Happy Baking! Hi, can I make sure his with whole wheat flour baking instead of using maida. Hello Sowmya, Yes, you can use whole wheat flour in place of maida. 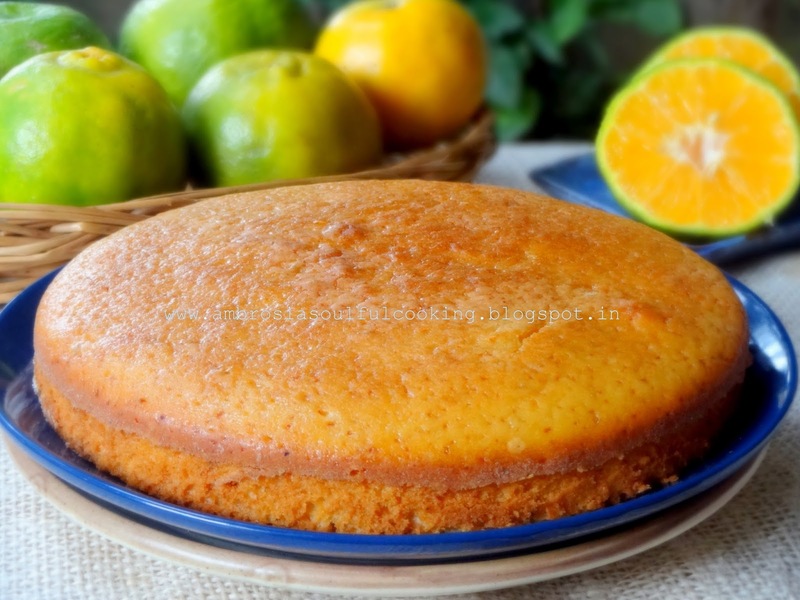 I have baked many cakes with whole wheat flour and loved them. Happy Baking! Can I replace the all purpose flour with wheat flour?? You mean to say 50% wheat flour and 50% all purpose flour? Hello Isha, yes, 50% whole wheat flour and 50% all purpose flour. This combination gives a soft springy crumb that is not too dense. Happy Baking!